Eleanor McEvoy came to notice when her own composition "Only A Woman's Heart" inspired the title for, and appeared on, the "A Woman's Heart" anthology album. "Yola" follows up 1999's Rupert Hine produced "Snapshots" album. 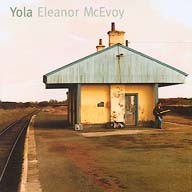 Yola was produced by Eleanor and her pianist Brian Connor with co writing credits going to Lloyd Cole and Henry Priestman (The Christians). Yola is an album of new songs that are allowed to fend for themselves with a musical but uncluttered background brought about by the stylish playing of Liam Bradley on percussion, Eoghan O'Neil on bass and Brian Connor on piano. "Did I Hurt You?" is a double A-side single with "Isn't It A Little Late?" Both are taken from "Yola", also on Market Square (MSMSACD113). The single is released in SACD "Super Audio" format - a world first! It is compatible with both SACD and CD players.